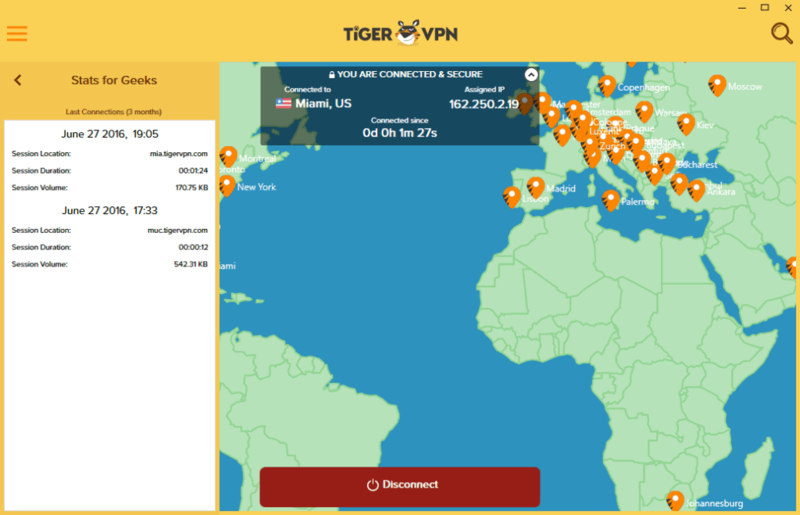 TigerVPN Review 2019 | Should you buy this VPN Service? TigerVPN packs a wide range of servers into an easy-to-use app, but occasionally struggles to maintain a strong connection. 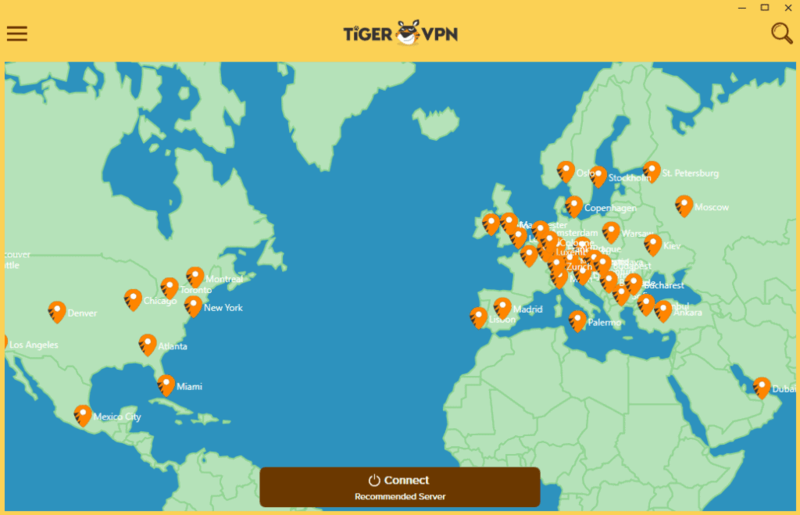 Created in 2011, Slovakia-based TigerVPN is neither a neither a newcomer nor a veteran in the VPN game. The company’s service is targeted at novice VPN users who want a quick and simple interface to privately access the internet. Despite being a relatively small operation, TigerVPN offers a wide range of servers and a polished interface. So how does it compare to top rated services such as ExpressVPN? A free trial gives those who would like to sample TigerVPN a 500MB data cap and a limited selection of servers. If they decide it’s worth paying for, users can choose from Zen Tiger, Strong Tiger, and Hero Tiger plans. All of the paid plans come with unlimited bandwidth and no data cap. The Zen Tiger plan kicks things off with two simultaneous connections for $9.99 per month, paid on a month-by-month basis. Prices are also listed but not converted for Euros and British Pounds, meaning the Zen plan also costs GBP 9.99 or 9.99 Euros per month. Given that USD is worth the least, it is the best deal if you have the option. The Strong Tiger plan is a six-month subscription paid all at once for $8.33 per month and tacks on another simultaneous connection for a total of three. Payments can be made by credit card, PayPal, and Bitcoin. The Hero Tiger plan bumps up the number of connections to five for $6.67 per month with a one-year subscription, making it the best value of the bunch (excluding the free trial). Hero subscribers also earn free subscriptions to StickyPassword, a password manager, and Shimo VPN manager, a VPN client for Mac. TigerVPN makes its own client, so Shimo seems a bit redundant unless you need to manage multiple VPN networks, and there are plenty of solid free password managers out there. Still, the extra simultaneous connections and discounted monthly price make Hero Tiger worth it if you’re ready to invest in a year’s worth of service. OpenVPN over UDP is the default connection protocol with OpenVPN over TCP, L2TP/IPSec, and PPTP all waiting in the wings. We recommend OpenVPN as the most secure and open-source protocol. Apps are available for Mac OSX, Windows, iOS, and Android. Manual setup is available for other operating systems. While TigerVPN doesn’t encourage torrenting, it is allowed on all servers. DNS leak protection prevents any web page requests from going through your ISP’s servers. Instead, those DNS requests are handled by TigerVPN’s own DNS servers. While the company doesn’t advertise a kill switch anywhere, a representative from customer support tells us it will block traffic should the connection ever drop. Update: TigerVPN does not have a kill switch. Customers can earn extra simultaneous connections through TigerVPN’s Karma program. This is a point-based system in which customers are rewarded for liking and following TigerVPN on social media and writing positive reviews on select websites. Does TigerVPN work with Netflix? Yes, as of time of writing users of TigerVPN can connect to a US server and watch the American catalog of Netflix shows. You can see more VPNs that work with Netflix here. Setup consists of simply downloading and installing the client and inputting a username and password. Once you’re up and running, you may select a pin from the map or just hit the connect button at the bottom to hop on the recommended server, which is determined by latency. For those of us bad at geography, clicking the magnifying glass in the top-right corner brings up a search-able list of servers that can be ordered by latency, city, and country. The top-left hamburger menu brings up options for customer support (opens web page in browser), display some basic connection statistics, and adjust the settings. 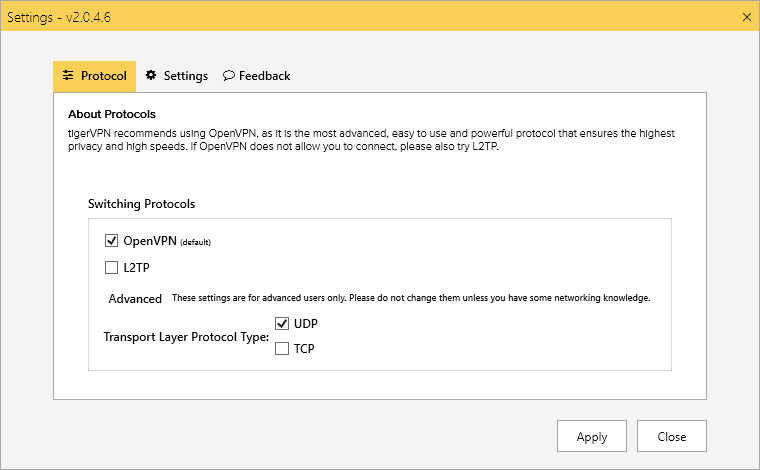 The settings menu lets users choose between the OpenVPN or L2TP protocols, UDP or TCP port, startup options, and send feedback. The mobile app is more or less identical to the desktop version with different screen dimensions. One addition is live chat support, which doesn’t exist on the website or the desktop app. More on that below. The app runs smoothly and is just as simple and novice-friendly as the big screen version. 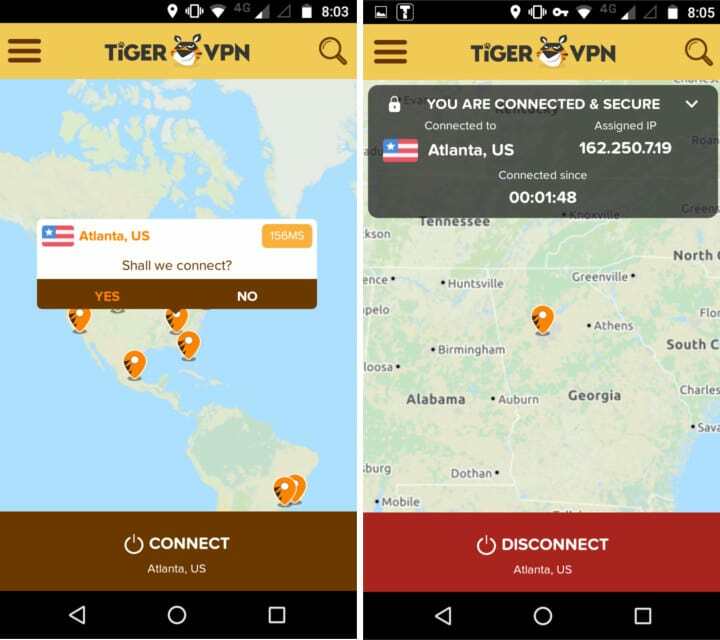 All OpenVPN connections through TigerVPN’s app are 256-bit encrypted, which is more than enough to thwart all but the most determined hackers and government agencies from snooping on user’s activity. Furthermore, the company doesn’t log usage, traffic, or any other activity that could identify users. It does, however, record customers’ IP addresses upon purchase in order to prevent credit card fraud. Session info recording time spent on the VPN and the amount of data transferred are also logged. TigerVPN says this information helps to provide a more stable service and provide the necessary resources to do so. The company is based in Bratislava, Slovakia, which is part of the European Union. It is not directly subject to any user data retention laws regarding VPN services. A NAT firewall is built into the app, which blocks any unsolicited inbound traffic. In most cases this is a plus, but it can hinder some P2P applications from correctly functioning. TigerVPN operates over 300 servers in 62 locations across 42 countries. That includes seven cities in the United States, two in Canada, two in the UK, and one in the Netherlands. While it does not own its own data centers, it does own the individual servers on the racks. TigerVPN made short work of 1080p HD video, quickly loading far past the buffer point. We were able to play Brawlhalla, a Super Smash Bros-style online fighting game, but frequent bouts of lag caused some frustration. For a more empirical speed test, we downloaded the same 82.7MB file (compressed from 103MB) three times from three different servers at three different times per day for a total of nine tests. We did the same without a VPN as a control group. We also included the test results for Buffered VPN, another VPN service we happened to be testing at the time, for comparison’s sake. We tested servers in Miami, Los Angeles, and London. In the boxplot below, the thick black line represents the median download time, while the red diamond represents the mean. Lower is better. While the median download time for TigerVPN was great, a couple tests struggled to keep the download rate above 100 KBps. This significantly dragged the mean download time upward. Judging by the timing of these tests, TigerVPN’s speed is appreciably affected by network traffic at peak times where its servers are located. Even after removing outliers (test results that are more than three standard deviations above the median), some of the results don’t even appear on the chart because they were so high. Including them would make the chart almost unreadable. Keep in mind that this test is not a definitive indicator of which VPN is fastest. The internet’s inherent volatility adds a significant factor of randomness, so VPN speed tests should always be taken with a big grain of salt. We conducted these tests in Buenos Aires, Argentina on a 10 Mbps connection. Those with faster connections may well notice a larger discrepancy in speeds. A ticket submission system is the primary means of contacting customer support, but users of the mobile app can avail of a live chat option not available on the website or in the desktop app. Responses weren’t exactly speedy; it took about half an hour to get an answer about the existence of a kill switch. Still, the wait wasn’t intolerable and the representative we chatted with seemed knowledgeable about the product. The response time was much better through the app’s “live” chat service than the website’s ticket submission system. A searchable knowledge base and FAQ section is available on the website. For the most part it was pretty thorough, though we did occasionally come across some text inexplicably published in German rather than English (no, we weren’t connected to a server in Germany). During our time with TigerVPN, we never received any unsolicited emails or other unwanted communication. 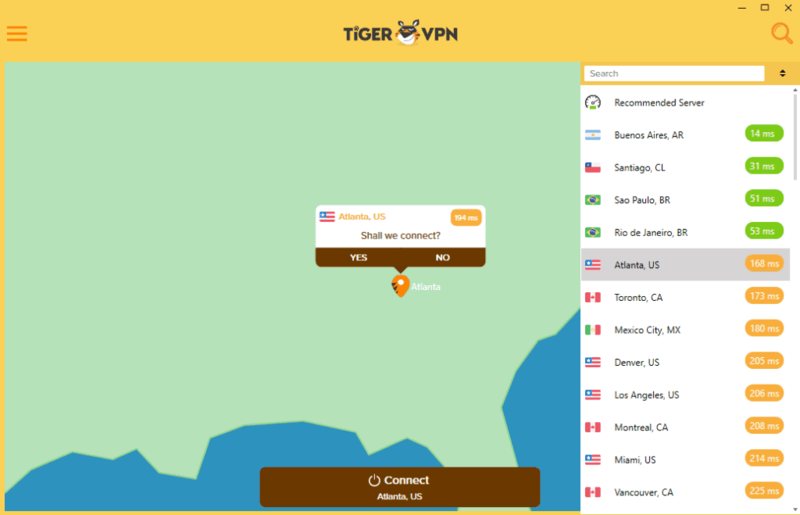 TigerVPN offers a novice-friendly VPN service at a competitive price. It offers servers in a wealth of locations, but connection speeds can be volatile. Security is solid, though some metadata logs are recorded. Thanks for posting your lifetime-subscription experience. Windows Central is pushing these and I am going to pass thanks to your review. Please check your plot for Tiger and in some other reviews. Something is missing or incorrect. For Tiger, mean outside any result. Perhaps each review should have a link to a brief explanation of your plot technique. My own personal experience is that speeds vary considerably (1/3, 1/2, 3/4 of max for that location), sometimes even within 5 minutes of each other (e.g., 30 MiB (different data each time) every 5 min for 100 min.) to each of several cities (NY, TX, CO, CA). Similar tests to high cap. server/site in my local area (MD/DC/VA) was pretty consistent (5-10%). I’m not sure 3×3 test will be representative. The mean download time for Tiger is high because the whisker on the box plot would be so far out of range that the plot would look even worse had I kept it. This is explained in the paragraph below the plot. I have been using another service with complete satisfaction for some time. I was intrigued by the lifetime subscription at a very affordable price so I recently purchased it. BIGGEST WASTE OF MONEY SINCE I LOST MY WALLET A FEW YEARS AGO. It frequently requires multiple attempts to get logged in and, once logged in, regularly drops the connection. This afternoon I couldn’t log in because it was giving me the error message that my session has timed out. After about 10 attempts I received the error message that my account had been suspended. I can’t contact customer service as they ask me for my login and password first, then it again tells me that my account is suspended. I can’t speak for everyone and I am sure that this problem doesn’t affect all customers, but for my money and input I am sorry that I ever even tried it.